LoveMe.com, also known as A Foreign Affair (AFA), introduces Asian, South American and Eastern European women to gentleman suitors. 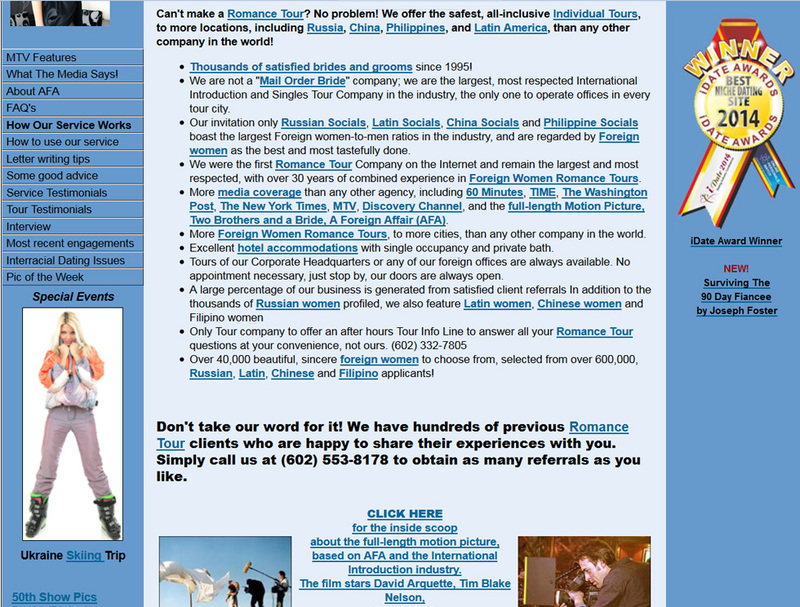 They also provide profiles, tours for singles, visa information, and gift delivery. Loveme.com prides itself on being the first Romance Tour Company on the Internet and says they are the largest and most respected. They have had extensive media coverage. The company doesn't consider themselves to be a Mail Order Bride business, according to the website. Located in Phoenix, Arizona, AFA has been providing their services since 1995 and has over 600,000 applicants and 40,000 beautiful women to view. The site lists many profiles of gorgeous women, 18 and over, and they are divided into groups based on their ethnicity. To join the site is by invitation only. AFA has various options to choose from: Russian Socials, Latin Socials, China Socials and Phillippine Socials. A client can have his pick of a Russian, Latin, Chinese, or Filipino woman. There are hundreds of success stories and the company welcomes anyone who would like to speak to their clients about their dating experiences. People who have done business with AFA talked of having a good time on their tours, meeting good people, and there were many comments like, "…best time of my life, positive experience, …wonderful time, …enjoyed the trip,…met the love of my life." If you have questions or concerns, unlike other sites, this company doesn't hide their phone number or doesn't have one. The phone number is listed right on the front page and physical office information is also on the web page. AFA offers a live telephone forum to answer your questions about international match-making, foreign women and more on Monday nights as of this writing. On Wednesday nights, they focus on the Philippine and Filipino women. The company also has weekly phone conferences with various speakers sharing much information related to international dating on Thursday nights as of this printing. The conference call details are on the front page of the website. A movie has been made based on AFA and the International Introduction industry with stars: David Arquette, Tim Blake Nelson, and Emily Mortimer. There were many positive reviews about the romantic comedy. Visitors to AFA can quickly get started looking for women or using a feature at the site on the top of the screen called, "The Match Wizard." Each weekend matching updates will come to your email based on your specific criteria. You can learn more about search later in this article. For singles who are interested in a guide that can help them through the entire process, AFA offers the comprehensive Executive Plan. This personalized service gives much to clients! Just to share a few things, the plan includes: a personal meeting, an in-depth questionnaire, videotape of the client to help with the match-making process, analysis and personality assessment, advertising, and more. The services and contact information of clients is kept confidential. Once you are a client, you will be able to search foreign women profiles, plan a romantic tour, and there are also individual romance tours. You can write letters to foreign women through their express mail service. Clients are required to fill out an IMBRA form (International Marriage Broker Regulation Act). The law protects parties when it comes to exchanging personal information. The search feature is very easy to use. You can search in many different ways by: age, weight, and region or use advanced search and select zodiac signs, English level, drinker, smoker, virtual email address, countries, and add additional keywords like a certain hobby, sport job, or hair color. When navigating the site, each tab is conveniently located on each page, so when you want to go back to main menu or check out something new, you can do so without using the go back button. Additional AFA services include: phone translation, gift delivery, obtaining a visa, apartment rentals, and adventure travel packages. When speaking with a foreign woman via phone there is a charge and she can give her contact information. This helps with getting to know her. If a client would like to send a gift there are over 100 locations and the gift would be sent within 24 to 48 hours. You can also meet your match by arranging a travel package. You can do things with your new love interest like: golf, skii, whitewater raft, cruise, and more. The company makes even hotel accommodations for you! There are safety tips provided when meeting these foreign women and advice on what not to do in your quest to meet that special someone. One drawback is that AFA doesn't perform background checks. Also, if to become a Platinum member, you must pay a nominal monthly fee and it is automatically renewed. In closing, the website, company, services, and opportunities to meet someone special are professional, informative, and definitely recommended by their many satisfied customers. AFA goes above and beyond to appease their clients. The many options to meet someone might be overwhelming to the casual dater or someone just looking for a good time in bed, but those sincerely interested in doing something different with their lives-like going on vacation in the hopes of making a serious connection with someone, AFA is right for you!